The intricate casting on this pen is truely amazing. The lattice work is very reminescent of celtic knotwork. Plated with a bright 24ct gold, this pen shines. 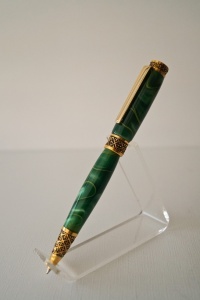 It's dressed with a blank that simulates the deep green of malachite. Overall this is a thinner pen, very well balanced, and feels good in the hand. It accepts a parker style refill for a smooth consistent writing experience.